Are True Corsos in the U.S.? At Outlaw Kennel, we feel that temperament is of the UTMOST IMPORTANCE. So much so that I feel it needs its own page to talk about. So why is temperament so important? Well, it means the difference between a dog that just looks pretty and a dog that will defend your home and family. It also means the difference between a dog that is 100% trustworthy and loyal in a family environment and a dog that is aggressive or unstable in the wrong situation. It means the difference between a dog that would rather stay in the house and watch over a small child and a dog that will take off the first time it sees an open door. When the show ring (or any other past time event) is used as the main determination of a guardian dogs worthiness the breed will become “watered down” because the temperament traits that made the breed so famous are being changed during the breeding process (most often unintentionally ) to fit the breeder’s current needs. Over time this renders the dog ineffective at its original intended purposes. Temperament does not necessarily mean how nice a dog acts towards people or other dogs. Temperament means the mental and physical characteristics a dog must possess in order to perform a specific task “or” job. So this means the “correct” temperament traits needed to be an effective seeing-eye dog are completely different than the “correct” temperament traits needed to be a good herding dog. The correct temperament for a guardian dog is different than the correct temperament of a duck hunting dog. Etc. etc. etc. Some dogs may have temperament traits that allow them to perform more than just one job but you see what I mean. While most American breeders talk about temperament they use no actual temperament testing procedure whatsoever, We use a temperament testing protocol that is designed specifically for the guardian dog . Correct temperament as a loyal fearless guardian is what made the Cane Corso a legend. and is what we specialize in! The above 5 traits make up the cornerstone of our temperament testing program. We use specific tests to evaluate these traits and incorporate them into our breeding program. 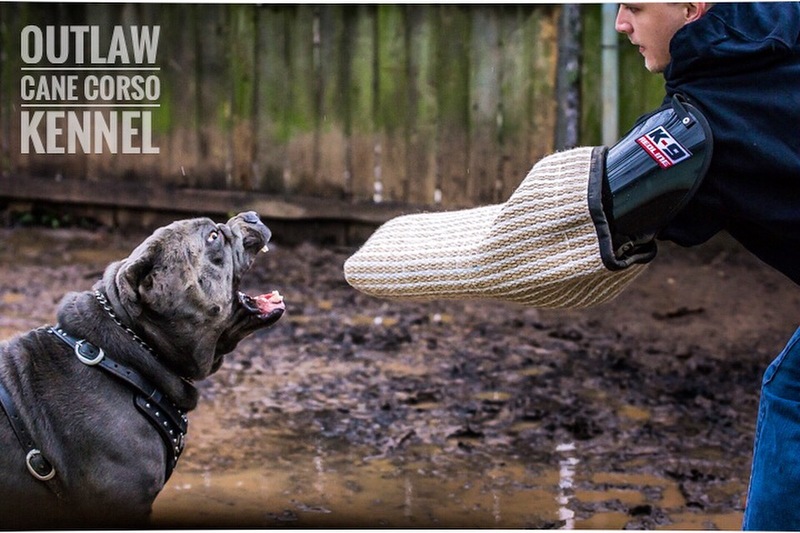 Our Temperament testing protocol is unique to Outlaw Kennel, it is something that we have developed after much research into the breed’s history. We take GREAT PRIDE in using historically accurate methods of temperament testing. Our goal is simply to keep this OUTSTANDING BREED true and not change it into something it was never meant to be. Every breeder has their own methods as to how they choose their breeding stock, this is ours! What about breeders that claim to have dogs that excel in all different areas? This sounds really good and sells a lot of puppies but the reality is as with most things in life there is always a trade-off. While the Cane Corso is a highly intelligent dog that is responsive to training and can be taught to perform well at quite a few different jobs, the breed (as a whole) does not match up to other breeds that have been bred over many years to have a specific set of temperament traits that allow them to excel in different areas. Allow me to give just one quick example; The Guardian dog and the Therapy dog…… One of the main temperament traits that make a great therapy dog is that it has to act as it has never met a stranger! It needs to be very open and loving with all strangers that it may interact with in the course of a day! Every stranger it meets is a lifelong friend. On the other hand, a true Guardian dog will have a totally different set of temperament traits in this area. He will be very standoffish and judgmental of strangers: he is trying to discern if you are there to cause harm to his family or property. While both of these dogs are great and they are both needed in society, they have a very different set of temperament traits when interacting with strangers. These temperament traits can be somewhat bred in and out of a dog breed (over a few generations) but there always seems to be a trade-off. Some countries, like Germany, have mandatory temperament testing that must be done on its working dog breeds before they can be registered, shown, or bred…this ensures the breed stays true to its original intended purposes. When these breeds make their way to the United States, where there is no mandatory temperament testing, the show ring seems to become the determining factor as to a dogs worthiness. Within a few short years, the originally great guardian dog becomes just a pretty dog that has lost all of its guardian ability (sigh). The Rottweiler from Germany is just one (of many) perfect examples. Because of the lack of proper temperament testing in the United States, we now have 2 very different Rottweillers types, the working and the show type. This is what makes the “pink papered” German imports so popular, they simply have not had the working ability bred out of them. When a true breeder works a “line” or “bloodline”, they are enhancing certain desirable genes while at the same time eliminating any undesirable ones within a particular breed of animal. Ok so what exactly is a gene? A gene is the segment of the DNA strand that is responsible for a way the dog looks or acts. When a breeder uses the selective breeding process they are able to manipulate the genetic traits that will determine how a dog looks or acts. This is why a Boxer is different than a Basset hound or a Quarter horse is different than a Clydesdale. There are over 500 hundred different breeds of purebred dogs on the planet and every single one of them were created using this process. As a matter of fact, all purebred domestic animals are a result of selective breeding. If you have ever heard that a dog comes from a famous “bloodline” or “line” It was because a breeder somewhere was able to develop a strain of dogs within a certain breed that excelled in a certain area! When breeding the Cane Corso as a Natural Guardian dog we are looking for a very specific set of genes “or” temperament traits that are responsible for Courage under pressure, Intelligence, Alertness, Loyalty and a strong sense of Responsibility. These are the 5 “key” genes that we attempt to isolate and enhance. We feel that these genes are the ones that are of utmost importance to the breed and keeping it true to its original intended purposes. So we simply test for the presence of these genes by placing the dog in a controlled environment and then judge its reaction to different types of stimuli. Afterwards, we use the selective breeding process in attempts to produce those genes in the highest percentage of litter turnouts as possible. All while trying to eliminate any undesirable genes (Diseases etc.) So that’s the Outlaw difference in a nutshell! Outlaw’s perfect Storm “Roman” being temperament tested as a Natural Guardian at its highest level. While I don’t disclose the exact temperament testing procedures that I use. I would like to include the following information because I feel it may be of some benefit to professional handlers/trainers. I breed this line of CC as a Natural Guardian. I find that the Natural Guardian reacts best out of a sense of responsibility as opposed to learning to react off of a triggered response. I would suggest that when looking for a strong desired response that the dog be placed in a very realistic scenario in which it thinks it’s actually defending it owner or property. If this type of dog is placed in a strange environment and handled by a stranger you may find it does not respond as well to some of the Traditional Agitation training methods (but there are always exceptions to the rule). Also as you would suspect I can definitely see the difference in stamina in the heavier CC’s particularly those that have the Neo. gene present in the phenotype. Since I breed the CC as a Natural Guardian I test it in its natural state at approx. 1 year of age after any potential genetic temperament traits have had time to develop. I test the dog without any type of advanced Agitation work of any kind. I do this because I feel that advance work could change the testing results I look for. I try to only look at the genetic traits that have been bred into the dog rather than how it performs after additional training. This should give it its strongest starting point for later work. As I’m sure you’re aware not all professional trainers are skilled breeders and vice versa. Each requires a specific skill set. My skill set is as a breeder (that actually temperament test the Natural Guardian ) not as any type of professional handler although I’m a great admirer! If your a handler that is new to this breed I would definitely seek the advice of other professional trainers that have experience with this breed for any tips in your specific area. When I breed and test I’m looking for 5 specific genes to work with. Courage under pressure, sense of responsibility, Alertness, Loyalty & Intelligence. I look specifically for these traits as I feel they are the ones that best pertain to the CC as a natural guardian. I do not directly test for a dogs tracking ability etc. that some handlers may be looking for. I always suggest that you look for a breeder that may be working a line that is excelling in the exact areas you need. On a personal note, when doing any type of advanced obedience work on my personal dogs I have always used the Koehler method, the only modification I make to this is to incorporate the e-collar for the latter stages of off lead work. The CC seems to respond very well to this type of training for me. Also please be advised that this line is still fairly young (3 generations in) so I’m still striving for true consistency in type but it shows great promise. I would also like to thank any professional handlers (trainers) for the work they do. Some of the working dogs that these handlers are able to train are truly amazing! Many of which help keep America safe! Thank you for your dedication to your craft. If your a novice reading this and looking for a dog solely for protection sports, I would personally recommend starting with a dog like Belgian mal. Be sure to find a breeder that specializes in the working type. This dog will have a much higher prey drive. Which in turn will make it very responsive to traditional agitation training. There is no one perfect dog for every situation. Each has there own skill set. It’s a matter of choosing the right tool for the job.